As gay and lesbian travel go, New Mexico tends to be popular among couples seeking romance, not singles on the make. Upscale, artsy towns like Santa Fe and Taos have little in the way of gay nightlife, and even the largest city, Albuquerque, has only a handful of gay bars and clubs, and a couple of longtime favorites have closed in recent years. For several years now, the city's best gay club has been Effex (more on that below), which continues to improve with renovations and expanded bar areas. So if you are visiting, and you're looking for some lively places to dance, mingle, and cruise, you'll find a few very inviting hangouts in Albuquerque. 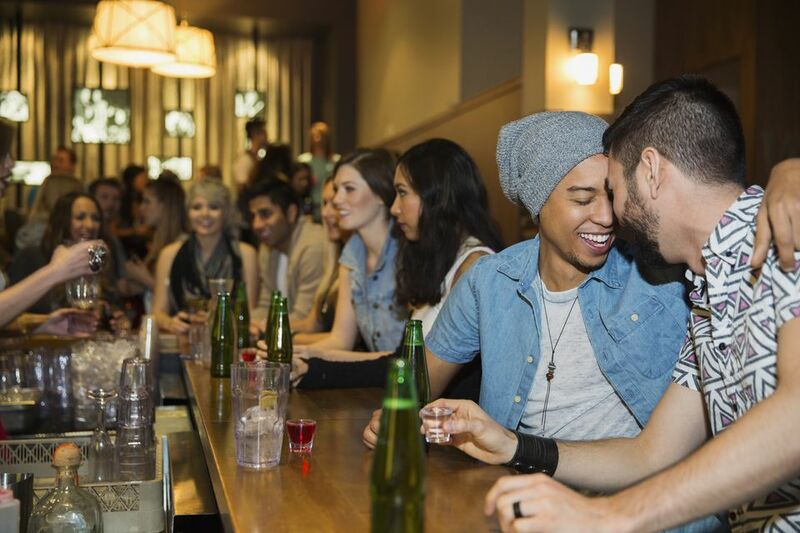 Most of the city's gay or gay-friendly bars are in the Nob Hill section of town, which is also home to several restaurants and coffeehouses with a gay following. Just a few miles west of downtown, however, you'll find what's quickly become the city's most popular gay hangout, Effex Nightclub. This attractive space could fairly be called the city's first genuine "big city" gay nightclub. It's a spacious, two-level venue just off downtown's main drag, Central Avenue, Schlotzsky's Deli, and it comprises a large ground-floor dance floor with bars, a big stage, and a state-of-the-art sound system. Head upstairs and you'll find a similarly huge roof deck bar that's ideal for chatting (and gazing up at those New Mexico twinkling stars). The owners have further plans to create a VIP lounge and add plenty of other great new features, and the crowds (both men and women) have been flocking here. Downtown is also home to the swanky and fairly new Apothecary Lounge, a beautiful tapas bar and lounge with an expansive roof deck that affords panoramic views of downtown and the Sandia Mountains. The mixed gay-straight venue at the elegant Hotel Parq Central is part of a renaissance that continues throughout downtown. Historic Nob Hill, which is bisected by famous Route 66, lies just east of the University of New Mexico and a couple of miles east of downtown. The main hangout here is the Albuquerque Social Club, a private club for gay and lesbians, and it's become the neighborhood's -- and one of the city's -- most popular gay venues. You must be a member to enter "the Soch," but all are welcome (as long as they have a valid photo ID). The cost is $30 for an annual membership if you live in-state, and $5 if you live out of state. This had been mostly a locals' hangout, but it's enjoyed a big resurgence of late and now draws sizable crowds, especially on weekends, and has a friendly staff. The one drawback for late-night owls is that the club is only open until midnight most evenings, although on Fridays and Saturdays the doors stay open until 2 am. Drive a bit farther east of Nob Hill along Central Avenue, and you'll come to one of the most venerable gay nightclubs in town, Sidewinders, which has the hottest club tunes, and always a great mix of people. The city also has some less traditional gay nightlife options, including the highly inviting local coffeehouse-restaurant chain, Flying Star. These hip, smartly furnished hangouts are spacious and attractively decorated, several of them with fireplaces and most with large patios. There are six of them throughout Albuquerque. The one in Nob Hill along Central Avenue has the gayest crowd and is downright cruise-central some evenings. The downtown Flying Star, as well as the Corrales location, also draw plenty of "family", but you'll feel quite welcome at any of them (others are found in the North Valley, Uptown, Northeast Heights, off of Paseo del Norte. The latest branches opened in Bernalillo, just north of Albuquerque en route to Santa Fe (and home of the fab Hyatt Tamaya resort), and in Santa Fe at the Santa Fe Railyards District. Would that every city had a hangout as festive as this one. All of the Flying Star locations serve three meals a day, a wide range of coffees, wine and beer, and fresh-baked goods, and they also have free Wi-Fi. For more on where to go in the Santa Fe, check out nightlife options in gay Santa Fe, and also be sure to consider the fabulous and festive Mine Shaft Tavern, a lesbian-owned roadhouse just an hour north of Albuquerque in the funky town of Madrid.